This is a recipe my mom had saved from a Baker’s chocolate box. It’s a classic coconut-chocolate combination, which you really can’t go wrong with. Combined with some condensed milk, this is a rich, decadent treat that really is as easy as pie. 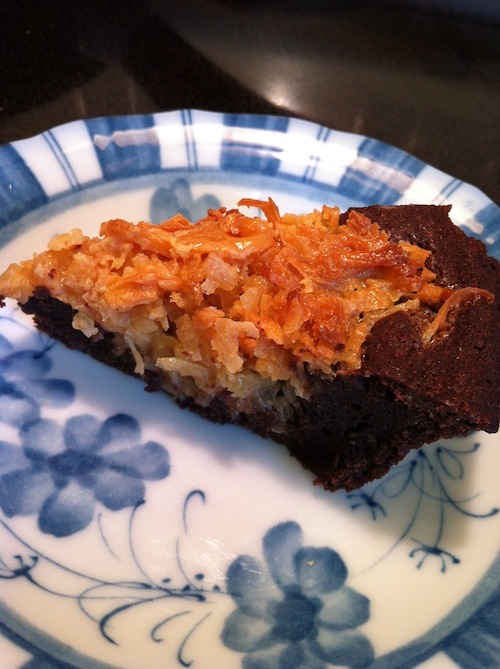 A delicious chocolate base topped with a sweet toasted coconut macaroon flavored topping, perfect for an easy, yet impressive dessert. Preheat oven to 350°F. Grease a 9″ pie pan with cooking spray. In a small saucepan, melt chocolate and butter over low heat. Remove from heat when melted and whisk in eggs, sugar, flour and vanilla. Pour into prepared pie dish. Mix together condensed milk and coconut and spoon over the chocolate mixture leaving a 1/2″ border. Bake for 25-30 minutes, turning halfway through. Allow to cool then serve and enjoy!